Nicki Elledge (Belle) and Russell Sunday (Beast). Photo by Jeri Tidwell. Columbia, Maryland is celebrating 50 years as a community, and in 2016, Money magazine recognized Columbia as the number one place to live in America. Since 1979 Toby Orenstein has been the Artistic Director and owner of Toby’s Dinner Theatre as well as the Founder and Director of the Columbia Center for Theatrical Arts. On February 12, 2017, Toby Orenstein was recognized by MD Theatre Guide as Person of the Year as part of the Best of 2016 Readers’ Choice Awards. There is no doubt that Toby Orenstein has contributed to the success of Columbia. Toby’s production of “Disney’s Beauty and the Beast” is the MUST-SEE family event of the spring! Toby’s dedication to unparalleled quality continues with her current production of “Disney’s Beauty and the Beast,” now playing through June 11, 2017. The evening I attended, a few little girls were dressed up in golden gowns as Belle and one boy dressed up as the Beast complete with horns. Adults got into the fun too with a husband sporting the word “Beast” on his shirt while his wife had the word “Beauty” on her shirt. I only say this because the expectations are obviously high to have a live production that is similar enough to the classic 1991 animated film and the new live action film starring Emma Watson. Judging by the smiles on the children’s faces, this stage production does not disappoint in delivering the same familiar characters, costumes, and of course the music by Alan Menken and the late Howard Ashman, along with new songs by Mr. Menken and Tim Rice. In her debut at Toby’s, Nicki Elledge gives a pleasingly steady performance as Belle, a strong, intelligent, and independent young woman. The tone in Nicki Elledge’s singing and speaking voice is a good fit since it captures the innocence of her character. Some of her most memorable moments on stage include her reading “King Arthur” to the Beast as well as her nursing the Beast back to health after he saves her from a battle with the wolves. David Jennings is the ultimate Gaston; a handsome, muscular, attention-seeking, self-centered, egotistical macho man. Together with his loyal sidekick Lefou (a funny freckle-faced Jeffrey Shankle), they seek to do whatever it takes for Gaston to marry Belle. My favorite production number of the evening is “Gaston.” After Belle rejects Gaston’s marriage proposal, Lefou, along with the villagers cheer him up with drinking, dancing, and of course lots of compliments to boost his ego. (As if his ego needed a boost.) This song is just one example where Director and Choreographer Mark Minnick gets to showcase his ability to create, innovate, and entertain audiences with his eye for detail and palpitating heart for the spectacular! Look for the precision of the clanking mugs along with the high energy of the ensemble. Jeremy Scott Blaustein is on fire as Lumiere, the suave, elegant, romantic, and light-hearted French butler. His friend, Cogsworth (played by a hilariously tightly-wound David James) is an enchanted mantle clock who keeps everyone on a timely schedule as the head of the Beast’s household. Other select performances to look for include Robert John Biederman 125 as Maurice, Jane C. Boyle as Madame Bouche, Elizabeth Rayca as Babette, Lynn Sharp-Spears as Mrs. Potts, and the Silly Girls: MaryKate Brouillet, Samanta McEwen Deininger, and Julia Lancione. The live orchestra under the musical direction of Ross Scott Rawlings, costumes by Lawrence B. Munsey, set by David A. Hopkins, sound by Corey Brown, and lights by Lynn Joslin add to the production values. 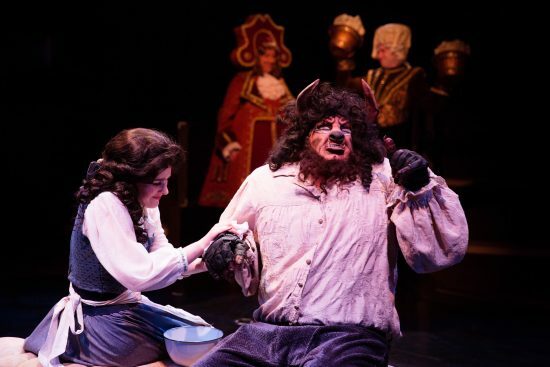 Toby’s production of “Disney’s Beauty and the Beast” is the MUST-SEE family event of the spring! But don’t wait to buy tickets, I’m told it is already 97% sold out. Running Time: Approx. 2 hours and 45 minutes with one 20 minute intermission. “Disney’s Beauty and the Beast” runs through June 11, 2017 at Toby’s Dinner Theatre in Columbia, MD. For more information, visit online.